The first thing we do after getting a brand new pc or after reinstalling operating system is installing essential software. This is most tiresome and time-consuming job as we need to download latest installers of all software and install them one by one. Will not be it great if we can install all essential windows software in just one mouse click? Yes, this wish can be true. To make this task easier we can use Ninite which will save lot of time. 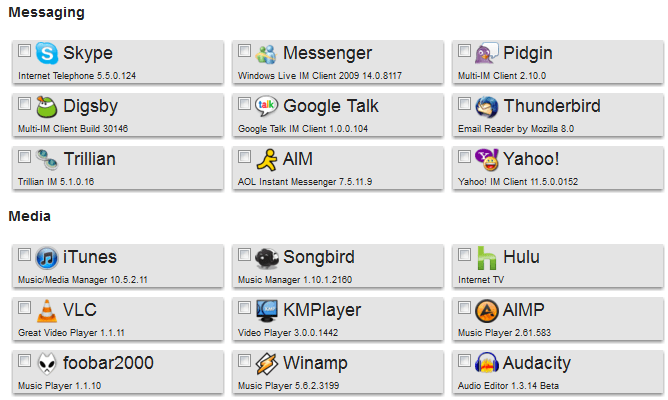 This very similar to Addonfox which helps you to install more than 100+ Firefox addons in single click. Ninite is a great tool to install and update essential Windows software. Just visit Ninite website and pick the software you need to install. You can choose from more than 80 best freeware applications available for Windows. There are browsers like Google chrome, Firefox, Opera messaging software like Skype, Google Talk, media players like VLC media player, iTunes and many security, file sharing, photo editing softwares and much more. No Toolbars Ninite says “No” to toolbars and other junk. No Clicking Ninite automates installers offscreen. 32 and 64-bit Ninite installs the best version of an app for your PC. International Ninite installs apps in your PC’s language.Fast No manual labor means installs finish quickly. And More Ninite Pro has even more features. Chose the software and click Get Installer. The installer is only 500 kb in size. Start the installer and it will download and install as software. You don’t need to do anything just sit back and enjoy. Ninite helps to save couple of hours which we waste after re installing Windows.